I have always had good vision except now as I get older, I find myself relying more and more on reading glasses. Small prints are getting harder and harder to read without the help of my reading glasses. If someone were to tell me that there are natural and proven ways to improve vision, I would be quite skeptical. If they were true, how come I have never heard of such a program before? Well, in the first place, I have never had to worry about my vision, so it was only natural that I had never bothered to find out more about such natural vision correction if indeed they existed, right? The all natural improve vision program that I am alluding to here involves special glasses and a computer software that work together to gently and effectively reduce eyestrain as well as correct other vision problems such as nearsightedness, farsightedness, astigmatism and poor vision due to aging. Does that not make you want to find out more about how to improve your vision especially when the program does not involve surgery? I would be interested to find out what those special glasses are and what sort of computer software are involved in this all natural vision correction system! I would love to do something about my long-sightedness! 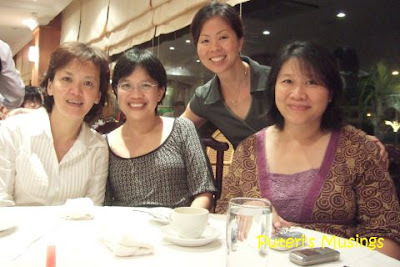 This trip back to Malaysia, I managed to meet up with a total of three blogger friends. Can you guess who that blogger to my right is? He wants to remain anonymous but I can give you a hint! During Lee's big and fancy New Year Eve's party, he offered his own security detail to guard us ladies who were decked in our very best finery and baubles! He took us to a very nice golf club and as it happened it rained heavily when we got there. So we sat down to have lunch and drinks until the rain cleared. I also met up with two Iban bloggers over the Gawai holidays. 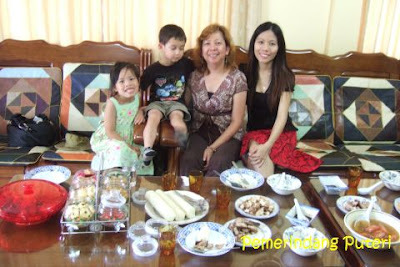 I wrote about my visit to them in my Iban blog. 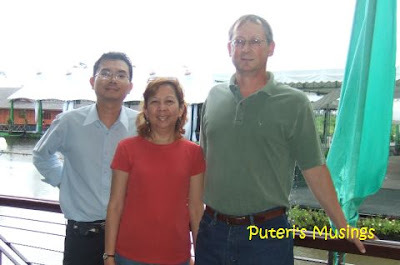 Doug and I have never been to Bintangor but we drove from Saratok to Sarikei first and took the ferry across the river in Sarikei to Bintangor. Cuthess, my Iban blogger friend met us at a gas station in Bintangor and we followed her in our car. She's getting married to a Canadian in August, and we plan on attending her wedding reception in Sibu. Good thing Doug will be back in Malaysia during that time. 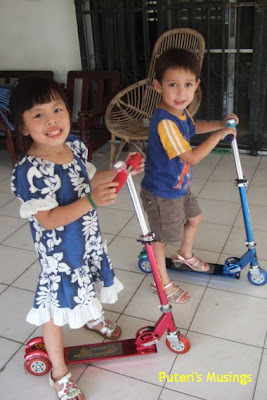 We also stopped to visit Grace and her brother, Fred, in Sarikei on our drive back to Saratok. Their house is along the road and it was easy to find. There are other blogger friends in Kuching that I would love to meet but unfortunately we won't be passing by Kuching this time round. But a couple will be at Cuthess' wedding reception in August and it will be an opportunity to meet up with them. We hope to meet Zawi in Kelantan. Doug and I look forward to meeting him and visiting Kelantan. It has been more than 20 years since I was in Kelantan! Our stop in KL this time will be short and there won't be enough time to meet up with anyone. I'd love to meet up with a couple of blogger friends if we had the time. Maybe next time, eh. 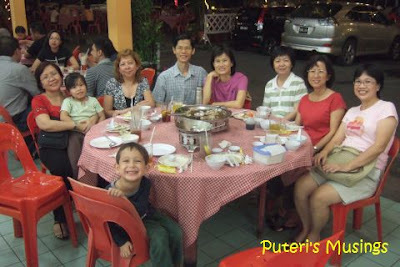 One of the best things about being home in Malaysia is the time spent with family and friends over a meal. My youngest brother invited us out to dinner a couple of days before we made the long drive to the longhouse in Saratok. One of my nieces and nephew watching the food being served. Clams, one of my favorite dishes! Belacan kangkong, another all time favorite! 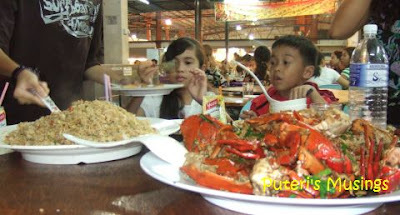 My second brother also took us out for seafood dinner after we returned from the longhouse. It was also the day Doug left to return to California. 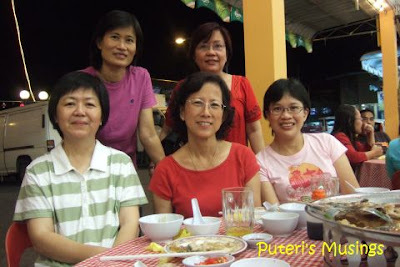 A bunch of friends also invited us to seafood dinner. It was great to meet up with these friends and fellowship over a delicious meal! Another group of friends invited me for Chinese dinner at a hotel restaurant. This time I left the kids at their cousins place. For once it was nice to eat in peace without kids interrupting our meal! When it was time to pick up the kids, Duncan objected and cried. He thought that I was depriving him of a sleep over at his cousins' place! It was a school night and the cousins wake up early and it was not convenient for them to have Duncan and Denice for a sleep over. One of my favorite activities when I am home visiting my parents in Miri is to go for a shampoo at my favorite hair salon quite close to where my parents live. As is their custom at this salon, I was handed a couple of women's magazine for me to browse through while my hair is being shampooed. This is the latest issue of Nona. I love flipping through Nona and looking at the pictures of the beautiful models and the rich and famous in Malaysia. 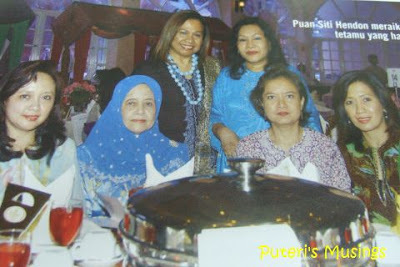 Guess who was in one of the pictures featuring a Mother's Day do in KL? Recognize the lady standing on the left? Yes, she is none other than our blogger friend, Ruby Ahmad! "Hey, I know her!" was what I told my hair dresser! Er, does anyone know of some do I can be invited to so I can also appear in a Malaysian women's magazine? Heheh. A HUSBAND COMES HOME FROM CHURCH; HE GREETS HIS WIFE AND LIFTS HER UP. HE THEN CARRIED HER AROUND THE HOUSE. THE WIFE WAS SO SURPRISED AND SHE ASKED 'DID THE BISHOP PREACH ABOUT BEING ROMANTIC'? THE HUSBAND SAID, 'NO, HE SAID WE MUST CARRY OUR BURDENS AND SORROWS'.